"This is actually a very easy and fast dish. I 'came across' this a few years back by just experimenting. Hope you enjoy it as much as I do! It is great with a tossed salad, or with tater tots and a vegetable. Bon Appetit!" Place chicken in a lightly greased 9x13 inch baking dish. Season with lemon pepper, garlic powder and onion powder to taste. Bake in preheated oven for 15 minutes. Turn over chicken pieces and add more seasoning to taste. Bake for an additional 15 minutes, or until chicken is cooked through and juices run clear. This is a great easy recipe, but it takes a good deal longer to cook in the oven than the recipe calls for. 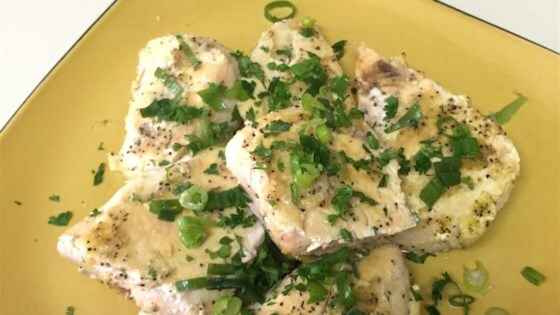 I thought this would be too bland, so I substituted garlic salt for the garlic powder and cooked it on my George Foreman grill...tasty and low fat too! This chicken is fabulous! We seared the chicken in butter and olive oil, and added lemon juice to the baking dish. Our whole family loved it.